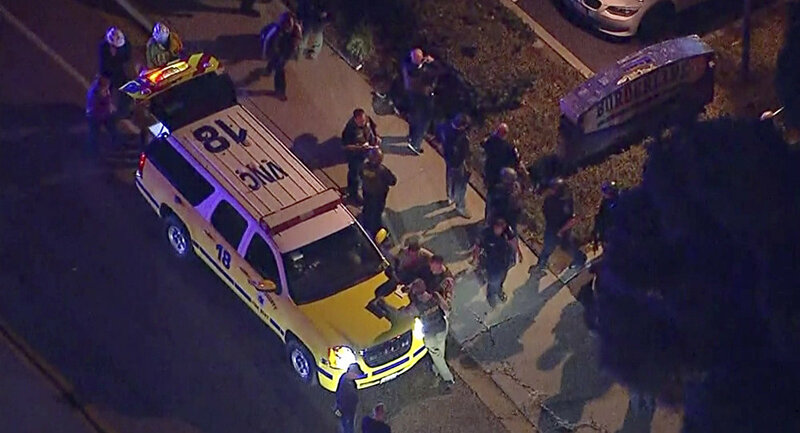 Dallas Knapp, a man who witnessed the deadly mass shooting in Thousand Oaks, California on Wednesday night, literally looked death in the eye as he filmed the gunman raiding the ill-fated bar. A horrifying video Knapp posted on Instagram shows the inside of Borderline Bar & Grill, a popular venue some 60 kilometres west of Los Angeles. A shadowy figure who is believed to be the perpetrator can be seen roaming around the emptying dancefloor, firing deadly rounds at victims. When the shots rang out, Knapp fled the bar through a door and ran into the parking lot, yelling, "Guys, run. He's coming out this door." "I looked him in his eyes while he killed my friends; I hope he rots in hell for eternity. The guy you see is the murderer and the shots are him shooting people trying to get out the windows," the survivor wrote. Police said that the suspect, identified as Ian David Long, a US Marine Corp. veteran with PTSD, was found dead inside the bar. He killed a total of 12 people, including a first deputy who responded to reports of shots fired. Who Is the Former Marine Accused of Killing 12 People in California?